Gday All, met aussie and a few others racing today and had a good race so decided to join, im new to VSK, just playing for a few weeks now, usd to sail back in the 90's, skiffs and yachts etc and now live 6hr from the water so getting my fix this way! It looked like you didnt forget any thing. you were sailing fast. Welcome. Yes, excellent work yesterday mate, you really have hit the ground running, unlike myself it took a very long time for me to learn even the basics. It is certainly a steep learning curve for some of us. Im very glad you joined Swifty, when I saw your name pop up during the game I saw Brindabella as a long time resident of Canberra I knew the name and boat well as a boat that won the Sydney to Hobart. I thought I may have even been lucky enough to run into another Canberran. I have since made the sea change and now live near Ulladulla NSW, Mollymook NSW. It is great to have another active Australian member here the Australian Team ARC members are many (7) but most of them dont race with me. Its great to have you aboard, please make yourself at home. Thanks for the invite and Enjoy racing with you guys! Im currently in Central NSW, been here for 7 years (too long)!! Do travel donw the coast a bit, ive got a house at Sanctuary Point and trael to Sussex a fair bit for fishing and such but sadly no sailing any longer! 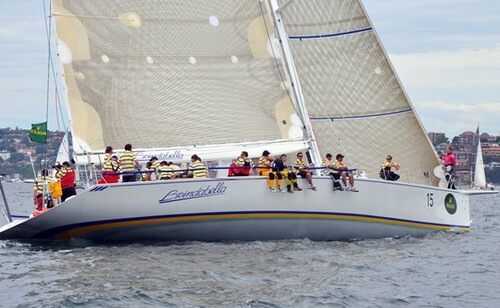 Brindabella was launched when i was a young fella, Not long after I used to assist at the CYC with the juniors and sail the Elliot 5.9's and one of snows boys was a student.. Always loved the look and lines of her and still dont think there is a nicer looking boat on the water! Used to sail in younger days like Flying 11's, had stints in Cherubs, 16's and done some 49er racing. Also Sailed offshore, done a series on yachts like Terrafirma and others out of the CYC. Would love to get back into it if i find a job down the coast sometime and can move back down there!